Whether you’re providing corporate hospitality or planning a work social event, our private party packages are guaranteed to deliver an unforgettable experience. Join our wine experts to sample and learn about a great selection of wines and tapas, whilst enjoying a murder mystery and catching the killer. Want dinner too? No problem – we can combine your wine tasting experience with a private dinner at a nearby restaurant. We can come to your office or any venue of your choice to host your interactive murder mystery event. To speak to us about your requirements and make a booking, click here. Our corporate events and team building activities encourage the development of analytical and time management skills, communication and improved team working. They provide a great after lunch refresher or a break from PowerPoint. Not only can they help meet your objectives for a team away day, murder mysteries also provide a great opportunity to energise your team and have fun whilst enhancing their capabilities. It provides the ideal atmosphere to uncover strengths and identify training needs in an enthusiastic and focussed setting. Collaboration: Sustaining a supportive team environment takes continued effort and innovation. That’s why our murder mystery activities provide a unique setting for your team to apply themselves and refresh their team working capacity. Communication: As you work through the different activities, discussion and debate naturally ensue. As delegates explain their interpretation of the evidence, it’s a great time to see who are the natural persuaders and influencers in your team. Problem Solving: Analytical skills will be tested through interpreting clues, solving riddles, and deciphering codes. A cohesive understanding of every aspect of the crime will be necessary in order to correctly identify the perpetrator. Presentation: The ability to present clearly in front of a group will be tested. Although this will be more challenging for some than others, this requirement offers a great opportunity for team bonding as everyone is asked to get involved. Morale Building: Murder mysteries offer the ideal setting for development and enjoyment. Held at the start of your day to break down barriers, or in the afternoon to boost alertness, your team will leave the session feeling confident and energised. Our team building murder mysteries encourage every delegate to take a full role in the activity. 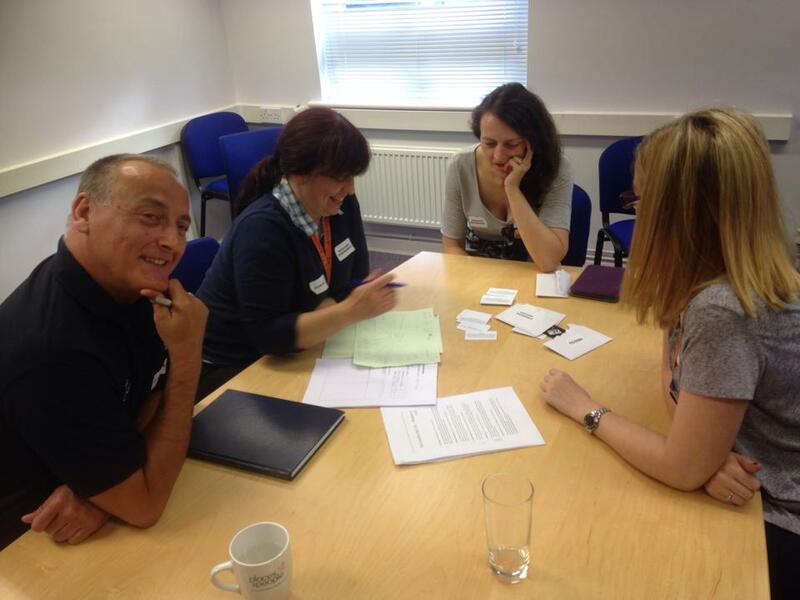 Led by one of our trained facilitators, your staff will benefit from taking ownership of each element of activity, from playing the roles to solving the clues. Every opportunity for challenge and development is seized to ensure you receive the utmost benefit from your day. Each activity lasts two hours and can take place at your office or another private space. We can arrange a private dining room in an excellent restaurant for your event to take place along with a meal. Contact us to discuss your requirements and make a booking. "It was the most fabulous day and we can’t thank you enough. Perfect organisation. We would highly recommend you and most certainly use you again." "The Murder Mystery session came as quite a surprise to many of my team members, and I was amazed at how quickly everyone got stuck in and working together thanks to your engaging facilitation. It was a really fun afternoon—I’ve never had so much positive feedback after an away day. Wouldn’t hesitate to do this again with a different team!" "The team said it’s been one of our best team activities ever, so thank you so much."